This summer was sort of OK for me in terms of Thunderstorm activity in my area except for one particular storm ... I don't remember exactly when it was - sometime in May or June. There were some frequent lightning strikes in the area and one particular hit was very close to my house. It wasn't a direct hit - I would say it was about a few hundred yards away from the house. We lost power briefly and when it came back - my home network was gone. Upon a close inspection, the first casualty was a 10-port Linksys ethernet switch - there was charring and obvious damage to the components, with chips blown into pieces, Then, I discovered 2 graphics cards were also gone - a Nvidia GeForce 8800 Ultra on the FlightSim machine and the graphics card on the Ham Shack computer - a Quadro4 NVS280. Finally, the built-in network adapter on the HamShack HP machine was also dead, alongside of a dead USB to RS-232 converter connected to the SteppIR Fluidmotion controller. I started wondering how the lightning discharge came into the house? ...everything in my lab is grounded - I have a huge copper ground bus, attached with an 8 inch wide solid copper strap to the ground rods and every single piece of equipment in the Ham shack is attached to this bus with solid copper straps. For sure it wasn't thru the power lines - otherwise I would have had a lot more damage. It wasn't thru the cable either - TVs, Cable boxes and Cable Modem were all good. All antenna coaxial feed lines were disconnected at the time of the storm so - no damaged radios. It was a mystery until last week when I powered up my SteppIR controller (it was disconnected from the power supply) just to be greeted by a dead display and all control LEDs lit up. This is what the Fluidmotion controller looks on the inside. The thing is a total toss. It absorbed a lot of energy. A lot of the "soot" on the PCBs is in actuality re-deposited metal vapors from the vaporized PCB traces. Even the metallized plastic shell of the male DB-25 control cable connector had some of the metallization vaporized and deposited on the outside of the box. The controller was grounded via the ground post on the back of the chassis to the main ground bus. 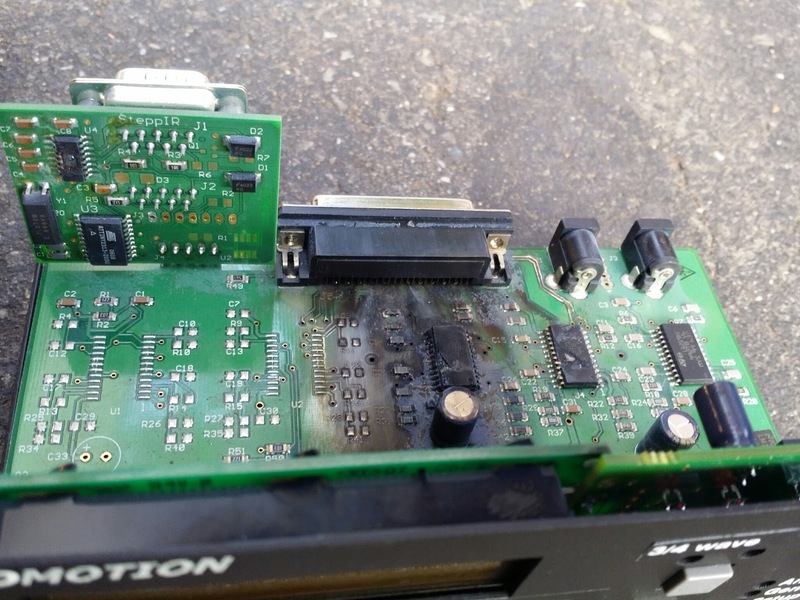 The transceiver interface board (top-left) was not spared by the lightning strike - one of the chips was blown to pieces. My guess is that the ground wave of lightning strike energy bridged the insulation of the control cable lying on the ground near the antenna. The cable is shielded so it traveled down the shielding of the cable and it found path to the ground via the controller. 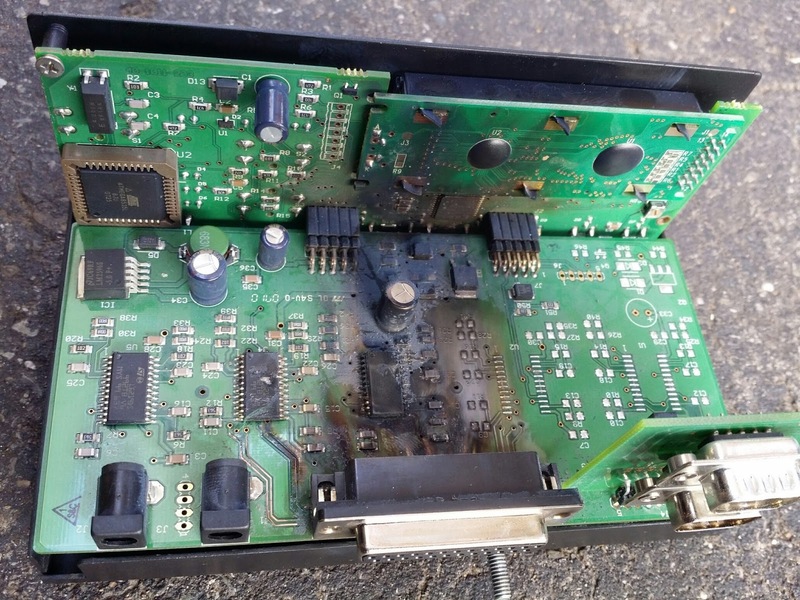 Since the controller was connected to the computer, some of the energy traveled thru the serial cable, killing the RS232-to-USB adapter on its path, and down the network CAT5 cable to the switch, killing the switch and the second graphics card in the Flight Sim computer. The severe damage seen in the photos is due to the poor (other adjectives come to my mind) design of the controller (Thank you for this SteppIR :-( - the outer shield of the female DB-25 connector is not directly connected to the ground lug!!! Instead, the chassis is connected to the board via 2 small posts, supporting the front PCBs. The top cover is all powder-coated, therefore insulated so no direct path is established from the the DB-25 shell studs to the ground post either. The lightning just traveled thru the main PCB, then thru the connectors to the front PCBs to get to the chassis and ground lug! This sort of design and execution is rather moronic (and I am being gentle here). Come on SteppIR! If you are in the antenna business, make sure the equipment is properly designed and grounded. Powder-coating and tiny PCB traces are not really "low resistance" for lightning energy - and this was not even a direct hit!!! UPDATE: I just received the SDA100 controller. Honestly, I have mixed feelings about it - while there are a few improvements, I really liked the "one button band selection" mode of the old controller. The user interface remains rather poor and definitely nowhere near the excellent Ultrabeam controller UI. The grounding is improved - they didn't powder-coat the inside on the back wall, thus allowing a direct path between the ground post and the shield of the DB-25 connector. A couple of tips: The ALP driver board, as I thought is pretty useless - just a bunch of relays disconnecting the driver chips. This will protect the chips from static and over-current but that's about it. At $4.87 per L6219 driver chip (DigiKey) - I need to destroy both of my driver chips 20+ times in order to make it worth the money. I didn't get the ALP driver board and would not recommend it to anyone. The controller is shipped with 4 chips installed, while my BigIR requires only 2 - EHU and 80m Coil so I have 2 spares inside already (the chips are on sockets this time around). Tip 2: If you really want the ALP driver board and you are buying a new antenna, or controller, don't buy it with the ALP board from the get go - get first the standard board and then later buy the ALP driver board - this way for only $64 more (the difference between the new option price and the upgrade price) you are getting another driver board to have as a spare part. In this regard, I don't think it is fairly priced - 8 relays and a few more components for $185??!? Final thoughts after 6 years - if I had to do my BigIR Vertical all-over. i'd go with the Ultrabeam vertical for sure - the SteppIR design is just executed too half-baked and sloppy for my taste.